Covering a 9.9 x 12.4 mm footprint, the model MS45xx Series ceramic based PCB mounted pressure transducer, from Measurement Specialties, comes in a 8-pin ROHS compatible package with pressure ranges of 0 – 762 mm H2O and 0 – 1 MPa. 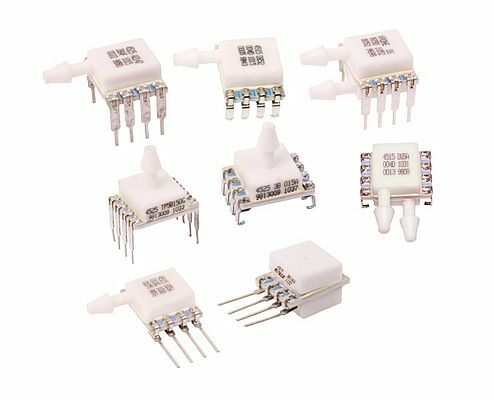 The series contains both high level analog output (MS4515, MS4525) and digital output (MS4515DO, MS4525DO) models, where the digital output versions feature either I2C or SPI interface and provide 14-bit pressure as well as 11-bit temperature sensing. All versions of the series use the latest CMOS sensor conditioning circuitry to create a low cost, high performance transducer designed to meet the strictest OEM requirements. The MS45xx Series is fully calibrated and temperature compensated with a total error band (TEB) of <1.0% over the compensated range. The rugged ceramic transducer operates from a single supply of either 3.3 or 5.0Vdc and is available in side port, top port and manifold mount and can measure differential, gage, absolute and compound pressures. The sensors also come in two pin configurations: DIL (thru-hole, J Lead) and SIL (thru-hole).The 1/8” barbed pressure ports mate securely with 3/32” (2.4 mm) ID tubing. This series is designed for flexibility and can easily be configured for custom OEM requirements where lower TEB values, custom pressure ranges, output clipping, or wider temperature ranges are needed. Battery powered devices requiring lower power consumption can take advantage of the MS4525 series (-L option) where current consumption is 0.6 μA typical for digital output. Safety critical OEMs can rely on the on-board diagnostic features standard on the MS45xx that ensure overall system integrity. Application use include but is not limited to: blocked filter detection, altitude and airspeed measurements, medical instruments, fire suppression systems, panel meter, factory automation and leak detection.